Known as the first Vietnam’s national university, Temple of Literature (Van Mieu Quoc Tu Giam) is the most famous traditional and cultural place in Hanoi in particular and in Vietnam in general. Temple of Literature was built as a university in 1070 dedicated to Confucius, scholars and sages. It is a traditional – style Vietnamese architecture offering a range of literature, the Well of Heavenly Clarity, turtle steles, pavilions, courtyards and passageways. Temple of Literature is the place where organized important examinations to find the doctors of the country. There were thousands of doctors who graduated in the first national university and now they have become a memorial to education and literature. Visiting Temple of Literature, tourists will learn more about the literature and educational tradition of Vietnam and take the change to see and explore the unique architecture of the attraction. Entering the Temple of Literature, you firstly will see a lot of ancient trees here and the special performance architectures. There are five courtyards from the entrance to the final part of Temple of Literature. Each courtyard has its own feature and symbol. For example, at the first courtyard, it extends from the Great Portico to the Great Middle Gate; the second courtyard has “Constellation of Literature Pavilion, and besides of it, there are Crystallization of Letters gate and the Magnificence of Letters gate; third courtyard has the Well of Heavenly Clarity. Besides it, there are 82 tombstones with names and origins of 1307 doctors which are displayed in this place. In addition, the symbols and vestiges in the past which are still remained in the attraction and tourists will take the change to discover and experience some traditional clothes and songs of Vietnamese such as: uniform of students of the imperial academy, ca tru. Every year, on the time of examinations, there are so many students who come here and rub the turtle heads to hope for luck. Just come to visit the Temple of Literature and explore the features of literature and education of this attraction, you definitely will know more about culture and tradition of Vietnam and get a deep impression with this place. 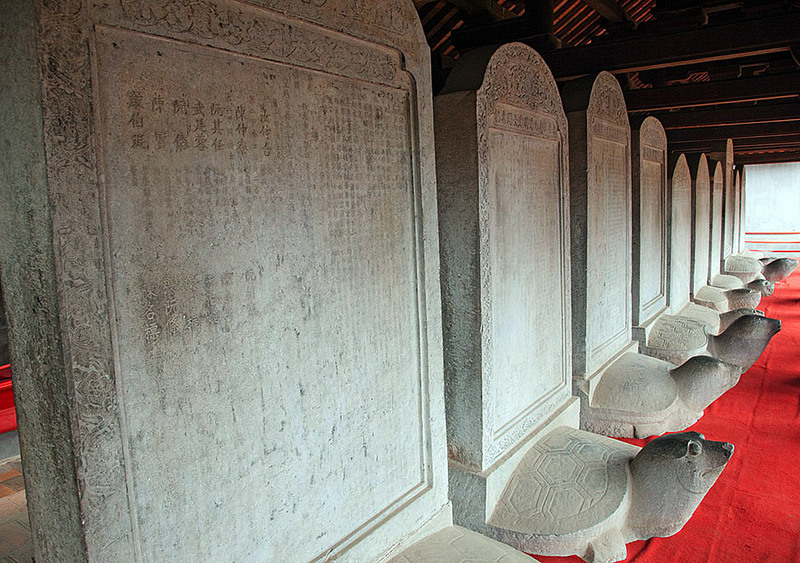 The Temple of Literature is a place of study rather than a religious landmark. There are five courtyards at the temple, two brimming with landscaped gardens, the third is home to a large pond known as the Well of Heavenly Clarity, the fourth courtyard is called the Sage Courtyard and features a statue of Confucius and a house of ceremonies, and the last courtyard is Thai Hoc in which stands a large drum and bell tower. This historic site is ranked as one of Hanoi’s most important cultural places and is steeped in Vietnamese history. The layout of the temple is based upon the birthplace of Confucius with a magnificent main entrance and a path, once reserved solely for the king, running through the centre. The immaculate gardens are rich in ancient trees and are considered a serene place in which students can relax. There are stone statues and inscriptions dotted throughout the temple which has retained many of its original features as the most renowned landmark of academia in Vietnam.